Big Data: Any Data. Any Time. The uncertainties surrounding the meaning and significance of big data are largely cleared up by now. What remains to be seen for many organizations is how to actually implement big data initiatives. 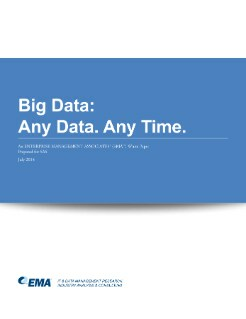 This EMA paper goes beyond describing the value of big data, and explores how organizations can exploit it to grow revenue, lower bottom line costs and improve overall corporate margins.